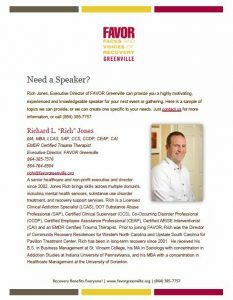 Rich Jones, Executive Director of FAVOR Greenville, is a highly motivating and knowledgeable speaker for your next event or gathering. Here are topics he can provide, or he will create one specific to your needs. This presentation reviews the science and biology of addiction. It includes a discussion on the difference between recreational use, heavy use, and the various indicators of a substance use disorder. The information is provided in a practical and straightforward manner and active audience participation is encouraged. This presentation provides a comprehensive and realistic look at the various levels of care. 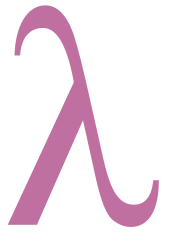 It includes information on when an intervention is indicated and on the treatment and recovery process. There is an emphasis on various pathways to recovery. This presentation explores the concept and practice of Family Recovery; the importance of awareness and education on the real and measurable impact of a loved one’s substance use on family members; and the critical role that family support plays in recovery from substance use. Positive Psychology is a distinct discipline that emphasizes what is “right” with a person and focuses on flourishing rather than “getting by”. This presentation provides an overview of Positive Psychology, along with some solid takeaways/tools for immediate use.